It's that time of year again, when the night becomes a little cooler, the colors start turning into shades of red and the ghouls, goblins, and ghosts start to feast upon the flesh and nightmares of the living! 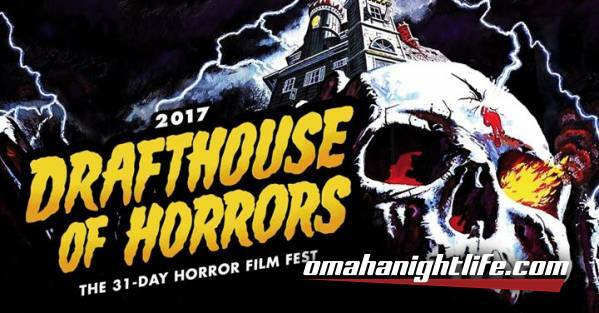 Chaos reigns and Drafthouse of Horrors 2017 is here to bring true terror to Omaha. The horror genre is filled with lackluster sequels and reboots that it's hard to have faith in the "Part Deux", but never fear kiddies because we are here to assure you that we took it upon ourselves to up the ante for DoH 2017 to give you 31 days of pure bloody entertainment. Like last year with our Universal Monsters mini-series, we pay homage to the world of Hammer Films with "Hammer It Home." Want some international flavor mixed in? We are screening some excellent (and rare) 35mm prints including Richard Stanley's HARDWARE (only available print on the planet...from Spain), DON'T LOOK NOW (courtesy of the British Film Institute), THE CURSE OF FRANKENSTEIN (courtesy of the National Film Society of Australia) and ANGEL HEART (recently discovered print by the Chicago Cinema Society Film Archive). But that is just scratching the surface of what we have in store for you in October so be sure to check out the full list below! And like last year, we'll have some special giveaways at select screenings and a very special guest for Dismember the Alamo! DoH 2017 also wouldn't be possible without the support of our event partners this year: Arrow Video, IFC Midnight, Camp Fear, The Basement on a Hill podcast and The Imaginarium.